WILLEMSTAD - After two amazing and fully booked evenings in the Master Villa at Baoase Luxury Resort, star chef Akira Oshima together Executive Chef Rene Klop, are looking back on another successful edition of ‘Vive la Gastronomie’. Akira Oshima is the former Chef of restaurant Yamazato at the Okura Hotel in Amsterdam, which under his leadership received its first Michelin star. Together with the team of Baoase Culinary Beach Restaurant, the exclusive restaurant of Baoase Luxury Resort, chef Oshima prepared a sizzling 6 course menu with authentic Japanese creations such as courses with Bluefin tuna, Kobe Wagyu beef and real wasabi root. The creative presentation and the taste sensations gave guests an experience which can only be delivered by chefs of this high caliber. 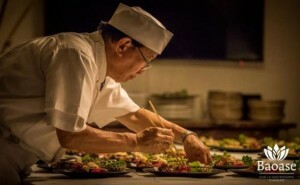 After star chefs like Viki Geunes, Roger van Damme and Jonnie Boer, Akira Ohsima can also count himself on the list of international culinary heroes that took part in the culinary event series of Baoase Luxury Resort, called ‘Vive la Gastronomie’. For more information on future chefs at Baoase Luxury Resort visit www.baoase.com or email events@baoase.com.